Is it completely different industry than the one of smaller yachts? Yes, of course! As I was explaining before, the megayacht industry has a totally different approach. It is not ‘just’ a matter of selling. The relationship with the client is personal and we work very closely with him: you have to sit down with a client, start from the shape, involve designers… to understand how to translate his desires into a new vessel. Every CRN Owner has a deep passion for his yacht and we are committed to carrying this passion through the vessel’s design and construction and even beyond. We are an atelier where the most important thing is to realize the Owner wish, helping him to take it out from inside of his brain, his heart, his guts…. and trying to understand what he is really looking for. Where do you see CRN in the industry? Today we can say that CRN is among the leading companies in the world in the construction of fully custom megayachts. It is not said by us, but all the most relevant stakeholders in the yachting sector agree with this point. It is easy to find out that our quality is close to Dutch yards, if not better, but at a more competitive price. 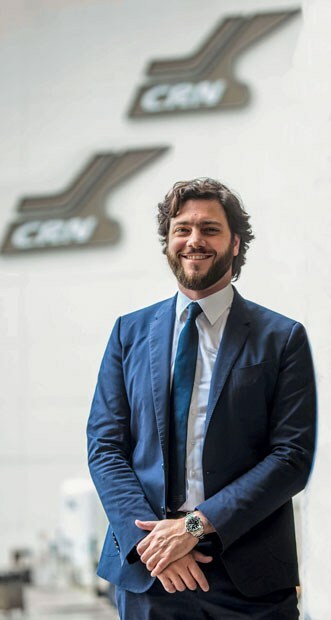 CRN has often led the way and it has established itself as an icon of Italian excellence and the creator of unique masterpieces. For this reason, our shipyard is considered a synonym of innovative craftsmanship where the Owners have the possibility to be an integral part of the developing phase, giving new input without any limits, a part from the technical ones. Our aim is to give shape to the Owners’ dreams and it is not just a slogan: you can see Atlante with remarkable and explorer lines, we’ve made streamlined Yalla and more classic Saramour with Paszkowski design. We’ve made Cloud 9 with a lot of volume but with design that doesn’t look so bulky… All of these yachts are completely different in terms of designs, as well as the ones we have under-construction in the shipyard now. To do all this, as you have seen, we restructured the yard and we organized the production differently, making a lot of investments to re-do some of the sheds. Everybody tries to go 100 meters and over, but one of our main pillars is that we will not build over 2.999 GT. Regulations change after that, there are other companies specialized in this kind of yachts. That’s not our job, we would be losing our main focus, which is built fully custom megayacht between 450 and 3.000 GT. Nowadays we are leader between 50 and 80 meters, which is around 2.300 GT. The five masterpieces delivered in the last five years are the concrete proof of our core business. The other thing is that I don’t know any atelier that makes 6.000 suits a year? We put a cap on our production and we want to do 3.000 GT per year, we calculated this is the ‘load’ we want on production. In this way we keep our clients served and happy, and our products don’t lose their allure. What does it mean on the pricing? I don’t have precise figures just because when I started in the industry everybody was talking about the length, then around 2008. everybody started to talk about the beam, and later about decks. Finally, everybody started talking about GT – that is the formula of volume. This is a lot easier to explain to clients, why for example Cloud 9 with 2.250 GT is more expensive then Yalla with only 1.650 GT. But as you can imagine this is a reductive approach, our yachts are unique and there are too many bespoke details (from interiors to specific technical requirements) to identify a specific price list. Each yacht is a masterpiece with its own value. Speaking about the next boat shows, what are CRN plans for Monaco Yacht Show? The Monaco Yacht Show is the most important event in the world dedicated to megayachts over 40 meters. I may affirm without any doubt that Monaco Yacht Show is The Event. In this edition CRN will display 74 meter MY Cloud 9 as an international preview. The nautical industry, in particular the megayacht sector, is definitely a niche market and the Monaco Yacht Show will be an outstanding business opportunity for the Company to show Cloud 9 as well as displaying new concepts. It is also a crucial occasion to strengthen relationships, meet customers and prospects on board. We are proud to be there with Cloud 9, a 74-meter vessel which has further strengthened CRN’s expertise and ability to work with a completely new design to fulfil an Owner’s vision. It is a cutting-edge yacht that perfectly combines state-of-the-art technology, the best CRN features and the quality. In the last years you also made a big efforts in Ferretti Group? Since May 2014, when I joined the Group, we presented 27 new models – the latest ones will be revealed by the end of 2017. Other 9 will be presented in 2018. In 2014 we had 54 models, apart from CRN. The average age of our portfolio was 6.3 years. Now we are aiming at 4.2 years. That is incredible if you think about boats like Aquariva Super. This contemporary icon is 17 years old, but there is no way we would change it, because it is absolutely amazing. One of the main reasons why Ferretti Group is once again a world leader in the nautical industry is because every year we are offering to the market new and fresh models. This is what the Group really needed to do. Our customers and new clients have to believe once again that we are not only a ‘match you turn on and burn’. This happened three times in six years in the recent past, and we couldn’t allow it this time. Which of these new models is special for you? I am enthusiast and I am feeling lucky to be part of the Group’s Product Strategy Committee, headed by Mr. Piero Ferrari, who personally follows every new project development. We arrange no less than 10 meetings for each new project and he is deeply involved in every new boat. The Custom Line Navetta 37 is quite special for me. I was involved in the project development, because of my previous experience in the super yachts, together with Mr. Ferrari. We changed 100% of the original concept: we took a risk to start from zero, despite some money had already been spent. The success of Navetta 37 is the best payback we could get. In about a year we sold five yachts and number six is under negotiation. Navetta 37 is a perfect example of Ferretti Group new era: we pushed our efforts and our experience to the extreme and we achieved fantastic results. You are able to work on really nice range of products? We have the luck to be part of a unique company like Ferretti Group. Nothing is easy, but with seven brands like the ones in our portfolio we can mark new boundaries. It is at the same time difficult because you don’t have just one type of client, but at least seven. And each brand has a huge fleet, to satisfy every Owners’ wish. Being a single shipbuilder could offer advantages, but being part of the second nautical Group worldwide guarantees financial solidity for all the stakeholders and a a great reliability in all the markets we are present. Which is the CRN typical Owner and how he relates himself towards yachting? CRN Owners are yachting enthusiasts and they really ‘live’ their yachts as their home. The first request of an Owner is to have a yacht which will allow him and his family to experience unprecedented emotions and perceive an atmosphere of all-pervasive excellence. Our Clients that fit into the category of UHNWIs – Ultra high-net-worth individuals – are mostly cosmopolitan businessmen scattered around the world. They are aged from 50 years old and they live and work in the world’s capital cities and move around freely.